Recently I’ve noticed much confusion about the difference between mica powder and pigment powder. Both can be mixed into and used to add color to resin, soap, candles, and translucent polymer clay. 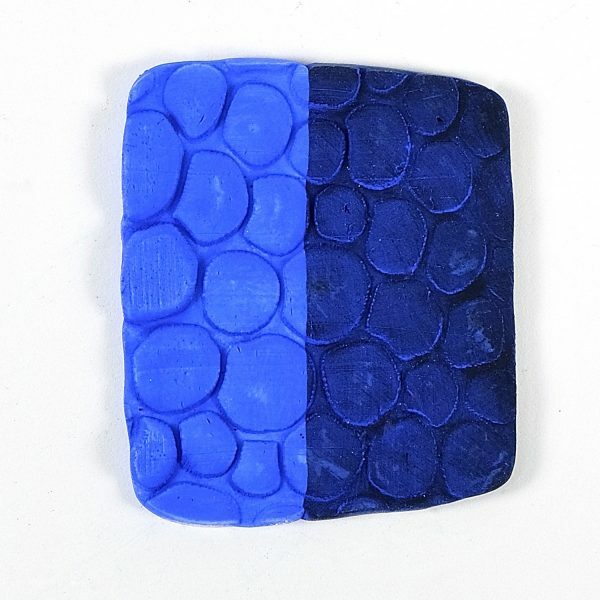 They are both colorants and can be used to color the surface of polymer clay. But they are not the same thing. Here’s the difference. Mica is sparkly. Pigment powder is matte. They behave differently. But online listings are often confusing and they’re sometimes sold mixed together in the same packet. And that can mean the powder you bought won’t work as you expect. Mica is a natural stone mineral with shiny flakes. When mica is ground into a powder, you get mica powder. Mica powders are therefore sparkly, sort of like very fine glitter. They’re used to give a metallic or shimmery pearl-like effect. They come in many colors. Pearl Ex is a popular brand of pure mica powder. (See a color chart of all Pearl Ex colors here.) While mica powders do often have color, they’re not optimal for coloring things because their main purpose is to create sparkle or shine. They won’t create a solid wash of bright color. Confusion happens when sellers of craft materials try to gain buyers by using confusing keywords. You often see listings in online marketplaces (like this one on Amazon) where the terms are used rather loosely. In this case, I’m not exactly sure what you’d get. You might get pigments, you might get mica powder, or you might get a mixture. And while we’re at it, these colorants are not a dye, contrary to what the listing says. Pigments and dyes are completely different things, as explained in this article. Both mica powders and pigment powders are used in the cosmetics industry. In fact, a combination of pigments and mica powder is used to create eye shadow, blush, and powdered foundation makeup. These can be used with polymer clay. You can read about Using Eye Shadow with Polymer Clay here. Cosmetic supply companies are excellent sources of both pigments and mica powder. But choose a reputable company to be sure of exactly what you’re getting. 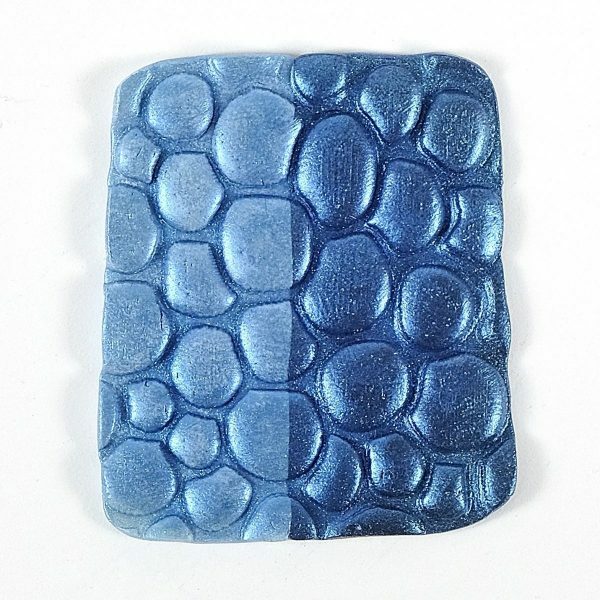 While both mica powders and pigments can be used to color the surface of polymer clay, they do behave quite differently. Knowing which material you have will help you know how to use it in your clay project. These are both incredibly versatile materials that can be used in so many ways beyond adding rosy cheeks to a cherub. For example, about a third of the veneers in my 100 Days Project are done using mica powders and pigment powders. Here’s an example of a veneer using only pigment powders, mica powders, and a stencil. Do you want to know more about using mica powders and pigment powders on polymer clay? You’re in luck. 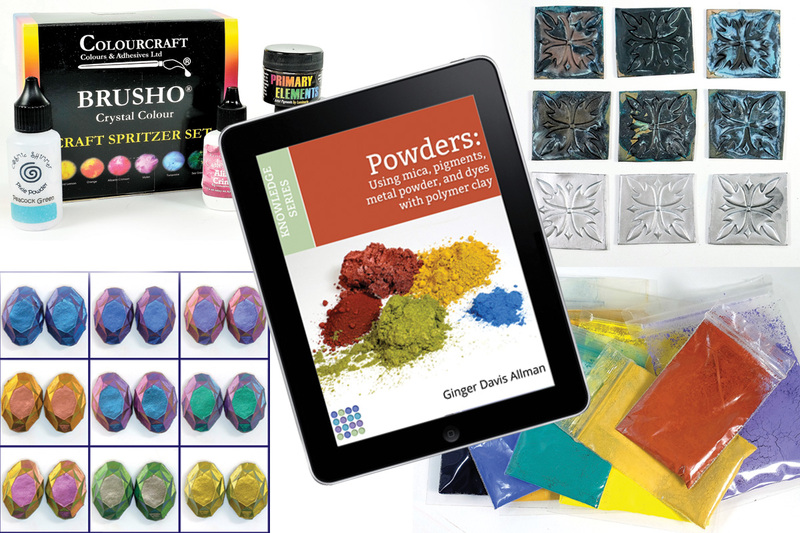 I wrote a huge 90-page guide called “Powders – using mica, pigments, metal powder, and dyes with polymer clay.” It explains all about these beautiful powdered colorants and how to use them in and on polymer clay and explains how to use them on both raw and baked polymer clay. This information will also be invaluable if you use these powders with other media. Check it out, I know you’ll love it! Ginger, you mention veneers in my 100 Days Project, can you give me more information on this project please. Sure! I’m doing it over on Instagram. I’m not sure where the project originated. It started in early April and has gone for 100 days. Participants just posted on IG and used a hashtag #the100dayproject to tag their photo. I took longer than 100 days to do mine because I had to travel in late June. But I’m on track for finishing August 1. I’ve found it to be gratifying because it gets me IN THE STUDIO every day and I have a reason to try new things. I have done long-term projects like this before and have always found them to be excellent for sparking creativity.